It’s time for our year-end Virtual Memories Show tradition: The Guest List! I reached out to 2017’s pod-guests and asked them about the favorite book(s) they read in the past year, as well as the books or authors they’re hoping to read in 2018! Three dozen responded with a dizzying array of books. (I participated, too!) Just in time for you to make some Hanukkah and/or Christmas purchases, The Virtual Memories Show offers up a huge list of books that you’re going to want to read! Give it a listen, and get ready to update your wish lists! This year’s Guest List episode features selections from 36 of our recent guests (and one bonus guest)! So go give it a listen, and then visit our special Guest List page where you can find links to the books and the guests who responded. Also, check out the 2013, 2014, 2015, and 2016 editions of The Guest List for more great book ideas! Follow The Virtual Memories Show on iTunes, Twitter, Instagram, Facebook, Tumblr, and RSS! The guests who participated in this year’s Guest List are Pete Bagge, Kathy Bidus, Sven Birkerts, RO Blechman, Kyle Cassidy, Graham Chaffee, Howard Chaykin, Joe Ciardiello, John Clute, John Crowley, John Cuneo, Ellen Datlow, Samuel R. Delany, Nicholas Delbanco, Barbara Epler, Joyce Farmer, Sarah Williams Goldhagen, Paul Gravett, Liz Hand, Vanda Krefft, Michael Meyer, Cullen Murphy, Jeff Nunokawa, Mimi Pond, Eddy Portnoy, Keiler Roberts, Martin Rowson, Matt Ruff, Ben Schwartz, Vanessa Sinclair, Ann Telnaes, Michael Tisserand, Gordon Van Gelder, Shannon Wheeler, Wallis Wilde-Menozzi, Matt Wuerker . . . and me, Gil Roth! Check out their episodes at our archives! Credits: This episode’s music is Nothing’s Gonna Bring Me Down by David Baerwald, used with permission of the artist. The episode was recorded on a Heil PR-40 Dynamic Studio Recording Microphone feeding into a Cloudlifter CL-1 and a Mackie Onyx Blackjack 2×2 USB Recording Interface . All processing and editing done in Adobe Audition CC . It’s late-night podcast-action with cartoonist Shannon Wheeler! 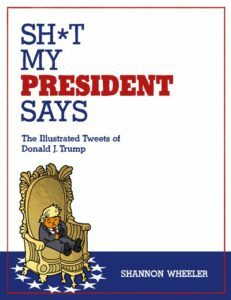 We get into the history of his Too Much Coffee Man comics and his new book,Sh*t My President Says: The Illustrated Tweets of Donald J. Trump (Top Shelf), learning the language of cartooning at The New Yorker (and learning to work with a new editor there), the ways his architecture training informs his storytelling, his discovery of the Fabulous Furry Freak Brothers at WAY too young an age, the cartooning trick that made him want to draw, his dream project on the history of northern California, and the redemption of the guy who used to dress up as TMCM at conventions! It’s coffee-fueled! Give it a listen! And go buy Sh*t My President Says ! Shannon Wheeler is the Eisner Award-winning creator of Too Much Coffee Man, who has appeared internationally in newspapers, magazines, comic books and opera houses. He has contributed to a variety of publications, including The Onion newspaper and The New Yorker magazine. Wheeler currently lives in Portland, OR with his cats, chickens, bees, girlfriend and children. He publishes a comic every day at tmcm.com. Credits: This episode’s music is Nothing’s Gonna Bring Me Down by David Baerwald, used with permission from the artist. The conversation was recorded at an undisclosed location on a pair of Blue enCORE 200 Microphones feeding into a Zoom H5 digital recorder. I recorded the intro and outro on a Heil PR-40 Dynamic Studio Recording Microphone feeding into a Cloudlifter CL-1 and a Mackie Onyx Blackjack 2×2 USB Recording Interface . All processing and editing done in Adobe Audition CC . Photos of Mr. Wheeler by me. They’re on my instagram.